Follow the instructions below as a guide to help to install your roller blinds. A small cordless drill to pre-drill holes if required. Pre-drilling your bracket holes will avoid splitting your timber, particularly if you have an older style house. It is also recommended for outside mounts. 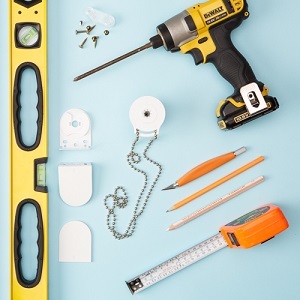 Installation screws for Timber installation have been supplied with your blind – if you are installing into Masonry or Aluminium, you will need to purchase the appropriate installation screws. Layout each of your blinds in front of the correct window. Starting with the first blind, remove the packaging carefully. Make sure you lay the blind down on a clean surface. If your blind is a white colour, it is handy to wear white cotton gloves whilst installing to avoid getting any marks on the fabric. Chain Drive - Open the attached bag containing the brackets, screws, ball stops and Child Safety cleat. The male bracket is used for the chain control side of the blind. The female bracket is used on the neutral or non-control end. A Link Layout #1 consists of 2 blinds each with independent control. With your blinds, you will have received 2 x male brackets and an intermediate bracket. Hold the male brackets to the place on your window frame where they are to be fixed at either end. With a grey pencil mark where the screws will go. Pre-drill the bracket holes if required. This will avoid splitting your timber, particularly if you have an older style house. For a Link Layout # 1, always install the Left-hand blind first as it has the larger piece on the pin end that will sit into the intermediate bracket. Start by inserting the chain end of the blind into the male bracket first. Before inserting the blind into the bracket – make sure the chain is hanging evenly from both sides and the flat surface is facing towards the top. Hold the chain end in position and move to the other end of the blind to insert the Pin end into the intermediate bracket. Now to install blind #2. This blind has the smaller metal pin end. Insert the chain drive end first into the male bracket - again making sure that the chain is hanging evenly from both sides and the flat surface is facing towards the top. Retract the metal pin by turning the wheel in an anticlockwise direction. Present the blind to the intermediate bracket, line it up with the pin end of Blind #1 and turn the wheel clockwise to release the metal pin. Once the blind is installed it should have 1.5 mm - 2mm movement from left to right between the brackets. The 'float' If not – adjust your brackets accordingly for secure fixing. Alternatively, you can adjust the pin end for more reach if required. 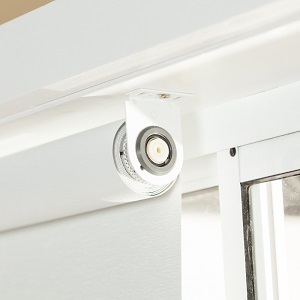 Using the chain drives, lower your blinds to the bottom of your window frame and then install your stop balls on the chain at the point just before it enters the chain drive. The ball stops will ensure that your blind is not over rolled when lowering. For outside mounted blinds, slide your bracket covers over the open side of each of your brackets. Install your safety cleats on either side out of the reach of children. A Link Layout # 2 consists of 2 blinds. A Drive blind and a Linked blind. Both blinds are controlled by the Drive blind on the left-hand side. With your blinds, you will have received 1 x male bracket, 1 x female bracket and an intermediate bracket. Hold the male & female brackets to the place on your window frame where they are to be fixed at either end. With a grey pencil mark where the screws will go. For a Link Layout # 2, always install the Drive blind first. Start by inserting the chain end of the blind into the male bracket. Hold the chain end in position and move to the other end of the blind to insert the Female Pin end (cog system) into the intermediate bracket. Simply push the pin end in with your finger and slide the blind into place. It should just click into position. This blind is now installed. Run it up and down a few times to create the tension in the fabric and ensure and it's not loose. At one end there will be a male pin end which is inserted into the female cog system on the intermediate bracket. If the blinds are not level when you present the 2nd blind, manually turn the blind up or down so that the bottom rails are lined up exactly. Insert the male cog into the intermediate bracket. Check again to ensure the bottom rails are lined up evenly. Then insert the other end of the blind into the female bracket. Run the blinds up and down again to check the level of the bottom rails. Then remove the blind from the cog system on the intermediate bracket and manually roll the blind up or down to get the corrrect level. When the blinds are level, simply reinsert the blind back into the brackets repeating the process above. If you need to remove the blinds for any reason, always remove the Linked blind first before removing the Drive blind. 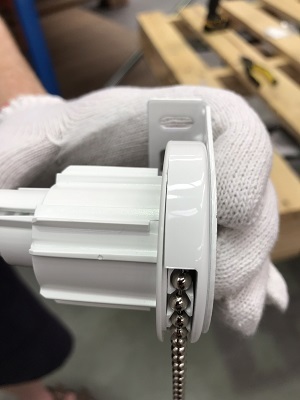 Using the chain drive, lower your blinds to the bottom of your window frame and then install your stop ball on the chain at the point just before it enters the chain drive. The ball stop will ensure that your blind is not over rolled when lowering. Install your safety cleat out of the reach of children. Before inserting the blind with the motor into the bracket – make sure the P1 button is facing the front - you will need to access and push this button when you pair your motor to the remote. 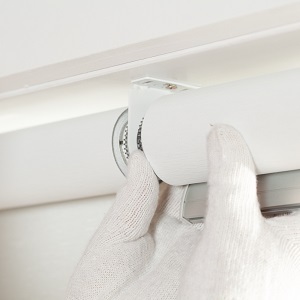 Have another person assist you when placing the roller blind into the brackets - Keep the blind level. Try not to tip the blind down at the motor end otherwise, it may slip out. 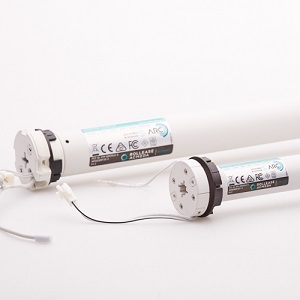 Ensure you unroll the fabric off the tube (approx 20cm) before you install so that when you are testing the up or down direction of the motor you have room for the roller blind to go up if required.